Lecterns, Podiums and Pulpits for trade show presentation or house of worship and Schools. 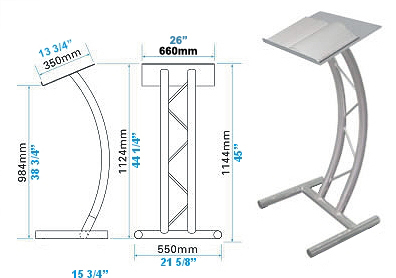 Huge selection of light weight aluminum lecterns and podiums. A lectern is a freestanding platform or piece of furniture which a speaker or presenter sets their speeches or notes while giving a presentation or speech. It's often referred to as a "podium" or "pulpit". In either case this has become an integral part of any presentation or speech. Public speaking and or presentations have used lecterns and podiums for centuries and have become common in churches, house of worship and schools. They provide a focal point for the speaker and function as a table top without blocking a clear view of the individual speaking. These have been made from wood and other materials such as plastic or acrylic over the years but these style lecterns and podiums are heavy and damage easily while being moved on and off stages. A school's podium must be light weight and easy to move as it's often young children responsible for this task. Church are often faced with the same issue. Plastic or acrylic models may be a little bit lighter but crack and smash very quickly when being placed or positioned. The cost of both plastic lecterns and wood lecterns make them more of a liability than an enhancement to productions and presentations. Church pulpits need to be decorative and functional. 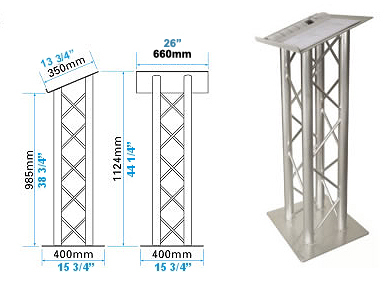 aluminium truss podiums and lecterns offer the best of both worlds. Cost effective, portable and stylish these pulpits from Exhibit and Display Truss make for the best priced lecterns and best priced podiums on the market. Browse over are designs and select the model that best suits your needs. If you can't find the perfect piece let us know and we'll work with you to deign a custom lectern or custom pulpit. Each and every model is domestically fabricated. Don't be left waiting for a tacky looking item from overseas to arrive from other suppliers. Avoid disappointment and select one of our high quality, professional models for your church or presentation today. Your satisfaction as always is guaranteed. #1. Aluminum truss lecterns are extremely light weight. Average weight approx. 15 - 20Lbs Vs. 50 - 125Lbs. for wood. #2. Aluminum truss style pulpits, podiums and lecterns look modern, high tech and last maintenance free for ever. #3. Aluminum truss podiums are strong & durable unlike fragile plastic and wood which crack, smash & mark easily. 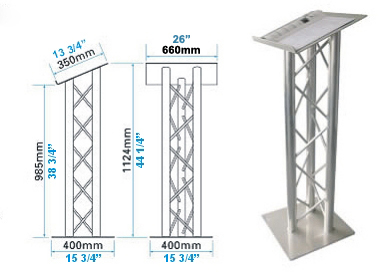 This light weight aluminum 3 chord 9" triangle truss lectern or podium is one of our best selling. With 1" chords and 1/4" webs and a large tilted top with lip and a stable base for a price that's simply hard to pass up. Church's, schools and trade show or corporate presentations will look fantastic using this lectern as it the best priced podium on the market. Light weight aluminum 3 chord 10" triangle truss lectern or podium 2" chords and 1/2" webs make for a bold presence. It's large tilted top with lip and a stable base make this podium or lectern the best priced lectern and guarantees great value. Church's, schools and trade show or corporate presentations can make fast and easy use of this lectern. Standard finish is natural mill aluminum. Click here to send email and order this item. Powder coat finish in your choice of color. $250.00 for the first unit and $75.00 for each additional unit. Stream lined custom ladder truss st lye lectern for presentations or for any situation a podium is required. Slanted aluminum top and stable base make this attractive, modern lectern for churches and schools good value for the price. It's one of the best price for lecterns out there and it's quality and performance or matched by none in it's class. Very light weight and strong. A modern, sleek design make this exciting lectern perfect for cutting edge presentations. Clean lines and attractive, churches and schools will find this light weight aluminum podium perfect in every situation a podium or lectern is required. It's a portable lectern that easy to move that delivers a visual impact unmatched by any other lectern or podium in it's class. Shown in powder coat paint blue and powder coat paint charcoal finish. The standard finish is mill aluminum. Fantastic value for an interesting functional lectern. Natural mill finish aluminum not avaliable. Churches and schools will find this light weight aluminum podium perfect. The extra large premium lectern top with front panel to add your logo or sign age make this podium the best lectern for the job. It's a portable light weight lectern that's easy to move and delivers a professional visual impact for corporate presentations and trade shows. No other metal podium, lectern or pulpit in it's class provides a front panel for logo's. Shown in powder coat paint white and powder coat paint black finish as well as the standard mill aluminum (silver) finish. Top of the line portable lectern at the best price. Clean and simple portable lectern. Perfect for Churches and schools as well as trade show presentations. 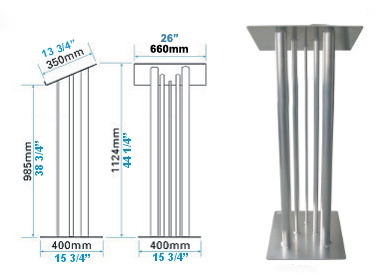 This light weight aluminum podium uses 2" aluminum truss tubes to make the stable base for this lectern. Open sight lines make this podium fantastic for any situation the presenter or performer needs to be seen clearly. No other lectern or podium in it's class provides curved lines and an open concept like this. Strong and functional with a modern high tech look. 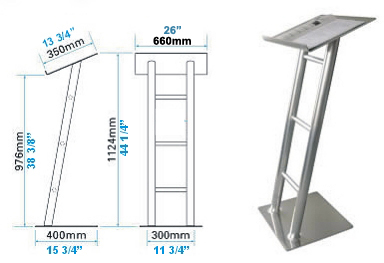 Great value for an exciting functional podium or lectern. Very popular design much like the EDT-2 Lectern this light weight aluminum 4 chord truss podium uses 2" aluminum truss tubes to make the stable base for this lectern. This industry standard is strong and functional with a modern high tech look. Great value for an exciting functional podium or lectern why buy a used podium or a used lectern when you can have new for a great price. 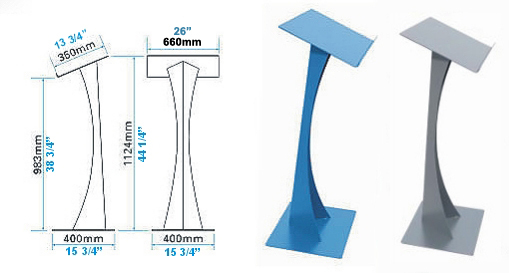 A modern, clean tube design make this exciting lectern perfect for cutting edge presentations. Straight line tubes like a pipe organ make it the perfect visual for churches and houses of worship. Schools will find this light weight aluminum podium easy to move and use delivering a visual impact unmatched by any other lectern or podium made with wood or or materials that are heavy or fragile like plastic or acrylic lecterns. This podium is simply beautiful! As in the EDT-LECTERN 1 this extra large lectern uses two sticks of 9" profile truss to create a large top podium for presentations. 9" truss uses 1" aluminum tube for chords and 1/4" webbing for a less intrusive look. Churches and schools will find this light weight aluminum podium perfect for holding documents and paper work while enhancing the visual on stage. The extra large is a portable light weight lectern that's easy to move and delivers a professional visual impact for corporate presentations and trade shows. 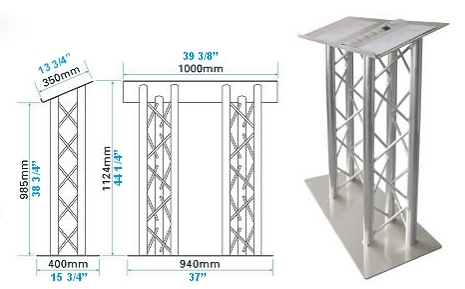 Great value and performance form an aluminum truss podium. Browse the web and you'll find the best podium prices are found right here. The best priced extra large portable lectern on the market. As in the EDT-LECTERN 2 this extra large lectern / podium uses two sticks of 10" profile truss to create the large top on this podium. 10" truss is fabricated with 2" aluminum tube for chords and 1/2" webbing for a bold look and is the industry standard for aluminum trussing products. Churches and schools will find this light weight aluminum podium perfect for holding documents and paper work while enhancing the visual on stage. Trade shows will use the extra space a valuable advantage with multiple speakers and present ors spreading their work over the huge surface. This extra large portable light weight lectern is easy to use and effortlessly move into post ion on and off stages and delivers a professional visual impact for corporate presentations and trade shows. 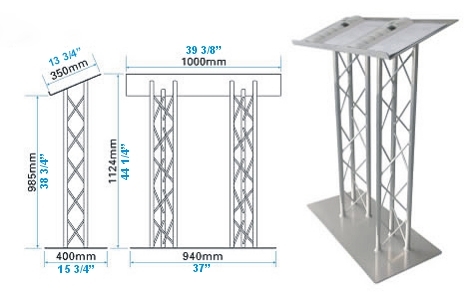 These are not like fragile plastic podiums or acrylic podiums Great value and performance from an aluminum truss podium. 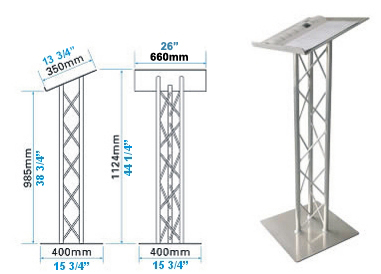 The best priced extra large 2" truss portable lectern.. Here at Exhibit and Display Truss we try very hard to fill the needs of customers and we realize that situations sometimes call for a specific look or visual. We are happy to design and fabricate the perfect piece for your next project or venue. Give us a call today and one of our team members will work with you to get it just right for you. The color you want, the shape and size you need. 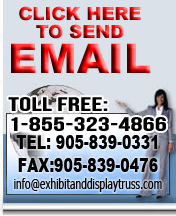 Nobody else works as hard for you as Exhibit and Display Truss. With over 30 years in business we make it our priority to serve your needs not just sell you goods brought in from overseas and tell you that's all there is. Our products are domestically made to fit your budget and lead time. Give us the opportunity to get it right for you today! Exhibit and Display Truss products are available in a wide variety of exciting finishes to suit your specific requirements and personal preferences. your company's branding and personal taste. Polished aluminum with optional lacquering or powder coat to any B.S or R.A.L. reference. Specialised finishes including various hammer tone and metallic colors can also be supplied for increased visual impact. 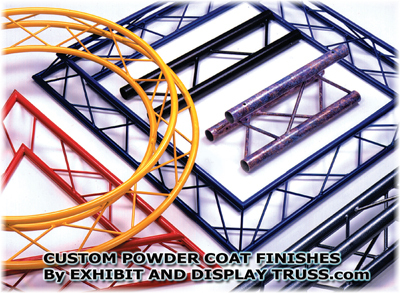 Contact our truss specialists today to discuss your custom finished powder coated aluminum truss project. Here are our standard colors.